There is a MODERATE avalanche danger on all aspects above 1,000' where triggering a shallow fresh wind slab avalanche is possible. 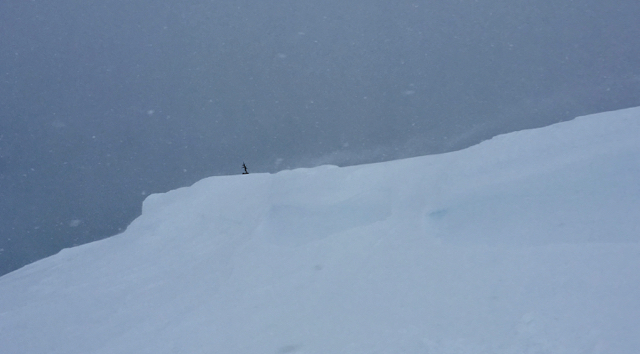 Recent strong winds have formed fresh wind slabs on a variety of aspects both near ridgelines and possibly further down slopes. Watch for these on leeward features where winds have drifted snow. There also remains a possibility of triggering a more stubborn, yet more dangerous, slab avalanche 2-3' thick due to a layer of buried surface hoar on slopes above 2,000'. In addition, be aware of cornices, surface sluffs, and a glide crack that continues to open up on Seattle Ridge. Below 1,000' there is a LOW danger where triggering an avalanche is unlikely. In the Summit Lake, Girdwood Valley, and on the southern end of Turnagain near Johnson Pass, a poor snowpack structure exists where weak faceted snow sits near the ground. Check out the Saturday Summit Summary HERE. Photo: Strong Northwest winds were transporting snow onto an Easterly face along ridgelines yesterday in the Girdwood Valley. Cornices: Winds have, and will be, adding more snow to the already large cornices. Remember these unpredictable hazards can break farther back along ridgelines than expected and have the potential to trigger an avalanche on the slope below. Give them extra space and avoid being under them. Loose snow avalanches: If you find terrain that is protected from the winds and harbors loose soft snow, expect to initiate sluffs on steeper slopes. Unlike the avalanche concerns associated with the winds, that are easily seen on the surface, we must remember there are lurking weak layers deeper in the snowpack. A widespread layer of buried surface hoar (buried on Feb 9th) sits anywhere from 2-3' below the surface. This layer continues to be found in most pits and although it is becoming very tough to trigger, it does continue to show potential to fail and propagate. For a better look at this, check out the video in our report from the Girdwood Valley yesterday. The bottom line here is, there is still a chance that a 2-3' slab could be triggered on steep slopes above 2000'. It has been 9 days since an avalanche was triggered on this layer and folks have been able to push further into the mountains without incident. However, with added load by winds and the chance a person could accidentally find the right trigger point, these larger slab avalanches remain a concern. Likely trigger spots are in places where the snowpack is thinner - near rock bands or on more scoured features. These slabs can break above you, and release after several tracks are on a slope. Be aware that no red flags may be present. Glide avalanches: The glide crack looks to be continuing to open above the flats along Seattle Ridge, just looker's left of the up-track and Repeat Offender slide path. Avoid hanging out under this crack and any others you may see. Mostly cloudy skies with a few flurries here and there were seen yesterday, Girdwood Valley picked up 0.5" of snow but other areas only saw a trace. During the afternoon, the Northwest winds picked up dramatically in many areas - Seattle Ridge weather station reported gusts up to 64mph with hourly averages up to 41mph. Sunburst weather station on the other hand does not pick up this NW flow very well and reported significantly less wind. Very cold temperatures are being ushered in by the wind and overnight ridgetops have dropped to the single digits. Today, cold air will continue to pour into the region from the Northwest with ridgetop winds in the 15-25mph range. Minus single digit temperatures are expected at the upper elevations while valley bottoms should be around 10F. No precipitation is expected and skies should be mostly clear. For the remainder of the week, partly sunny skies with very cold temperatures should persist. While no new snow is in the forecast, we should see the gusty Northwest winds decrease.